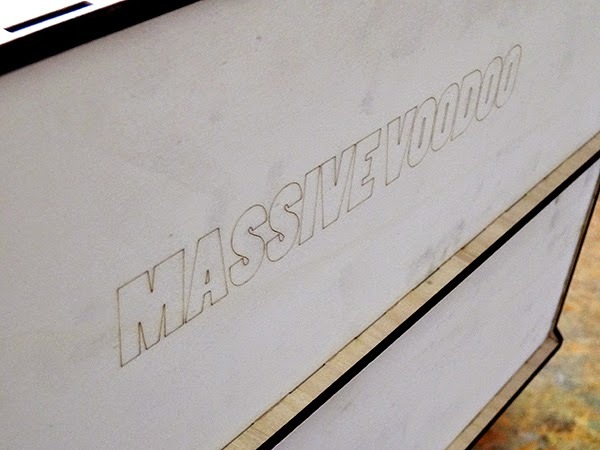 MASSIVE VOODOO: Building the perfect Paintrack - The journey! We want to tell you a little bit about a journey that accompanies us for the last months. Everything started with the painting class in Blumberg that Roman, Raffa and Sanne were traveling to in March. While packing up their stuff, Raffa's old paint rack broke and he had to put all his colors into cardboard boxes to take them with him to the class. Very time consuming and it wasn't the first time having problems with these flimsy paint racks. 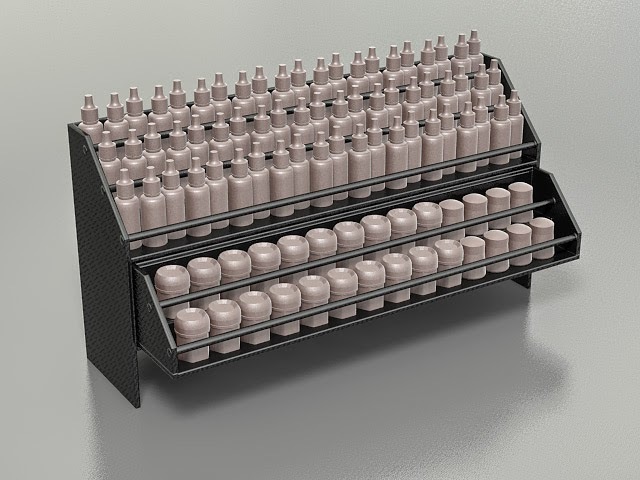 What would the perfect paint rack look like? - Offering a lot of space for colors while still beeing compact on the desk. - Able to reduce it in size to do different tasks on the table with maximum space. 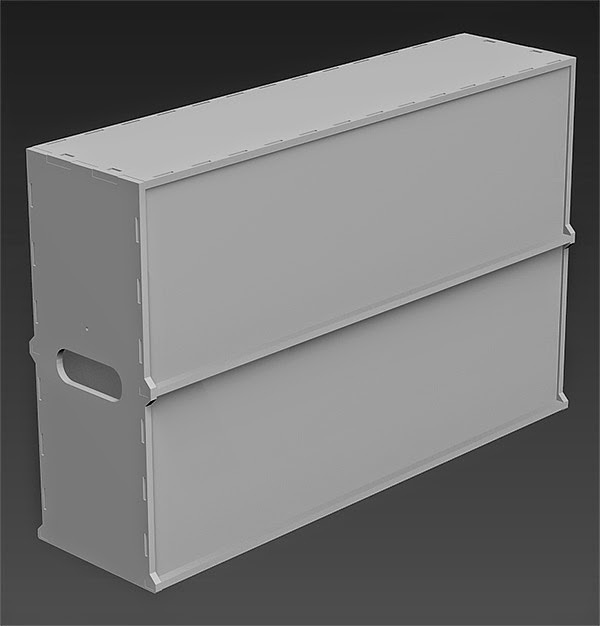 - Needs to be able to store all brands and kind of colors. - While transported the colors need to stay in place. - It should be elevated to have some space under it to put stuff there. - Needs to be rock solid! That was quite a list and finding a solution for all the demands wasn't easy but he came up with a concept that looked pretty cool. 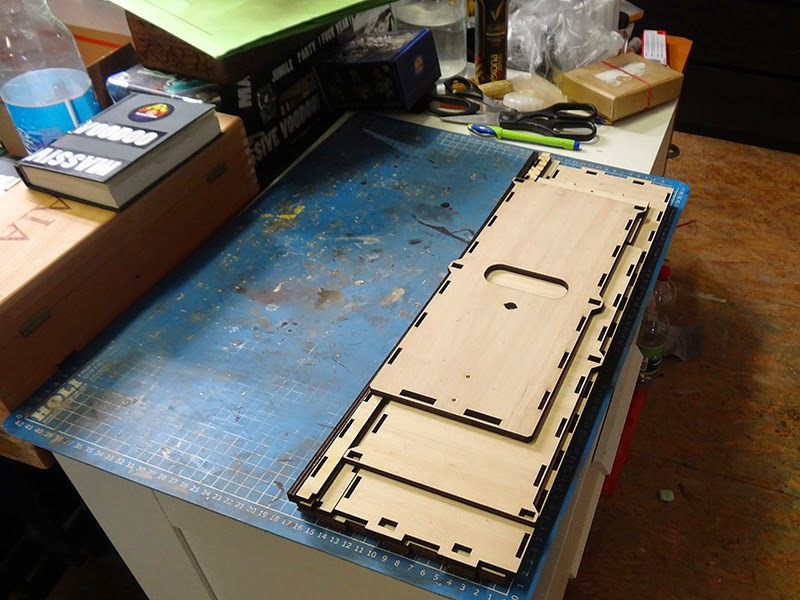 After talking with the others in the studio we made some alterations to the design and build a first prototype in 3D. Painted black it looks pretty cool. While Roman is not a big fan of paint racks, painted black, even he liked it. After Raffa posted these photos on Facebook a lot of people asked for one of those paintracks. And so, the journey really started. perfect brushes, perfect colors, perfect lamps, perfect minis. But paint racks still like they were 10 years ago. Raffa put his brain on 110% to think about the perfect paintrack that we could bring to you. 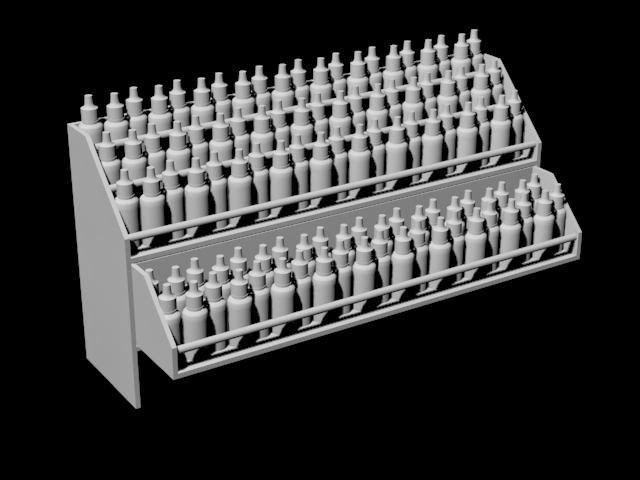 The friends on Facebook, Roman and the others in the studio had some more ideas and things to improve regarding the prototype ... making the paintrack so that Vallejo sized bottles could also be stored in the drawer of the paintrack (and it can be closed). A lot of people said that a transportable version would be awesome, so we considered that. 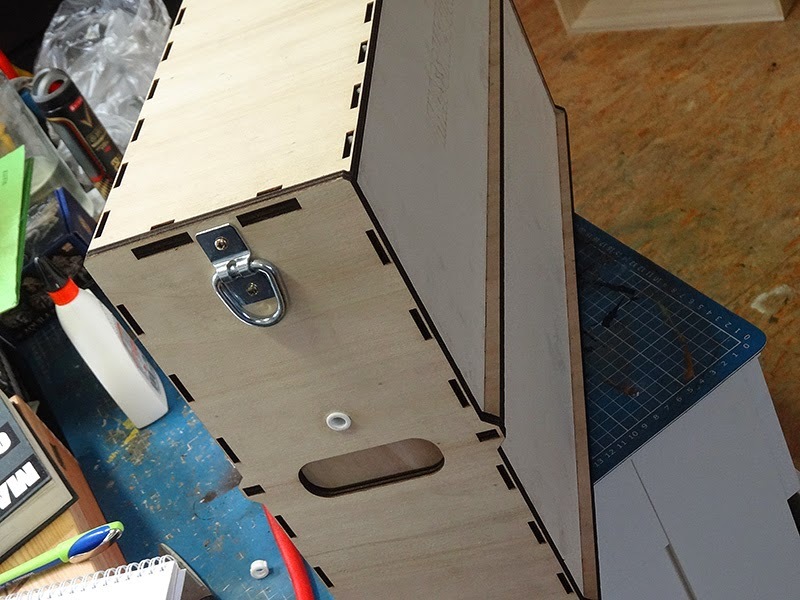 It should be very solid and it should be laser cutted, so it can be assembled by everyone at home. 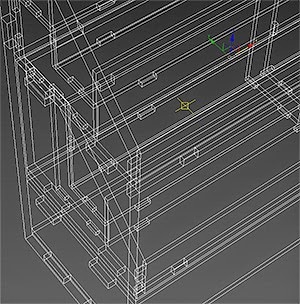 We already spent a lot of hours on the design and concept, making prototypes, building them, finding stuff together with the others that can be improved. That above was the first physical, real prototype of the paint rack we received, what an awesome feeling! It was already very cool, but a lot of stuff could still be improved. We found that assembly was still too complicated and needed almost half a day. We also decided to give the idea of a transportable paint rack a go. 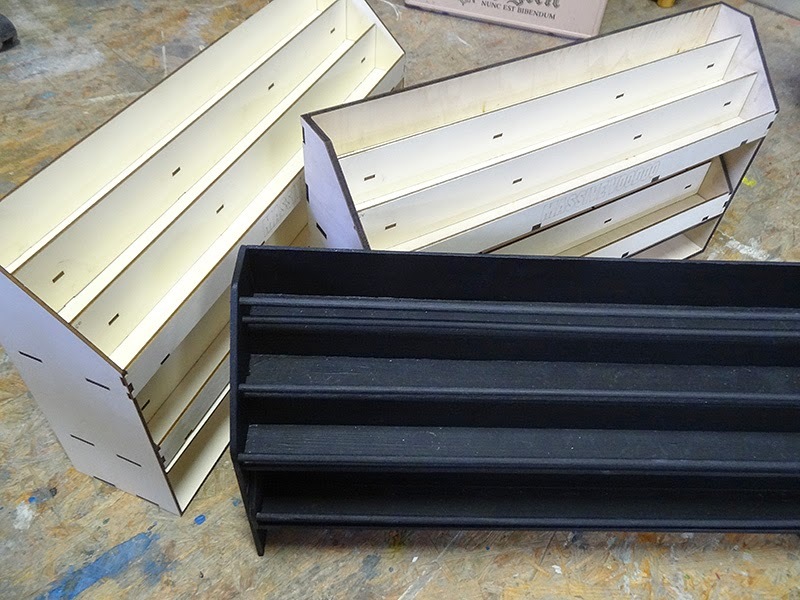 Just imagine, one step and you could take the rack over your shoulder and carry all your stuff to your friends place, hobby store, painting class or painters meeting... or just put it away to make even more space on your desk (after all the whole rack is just 12cm, less than 5inch deep). A concept for a transport box was made and Raffa's brain almost melted in finding a simple, reliable solution how to make this thing work. The latest prototype is just awesome, so much stuff was improved from the first version and we are really proud of the transport box. Everyone we showed it to so far was thinking the same way, just a cool idea and a really solid thing! 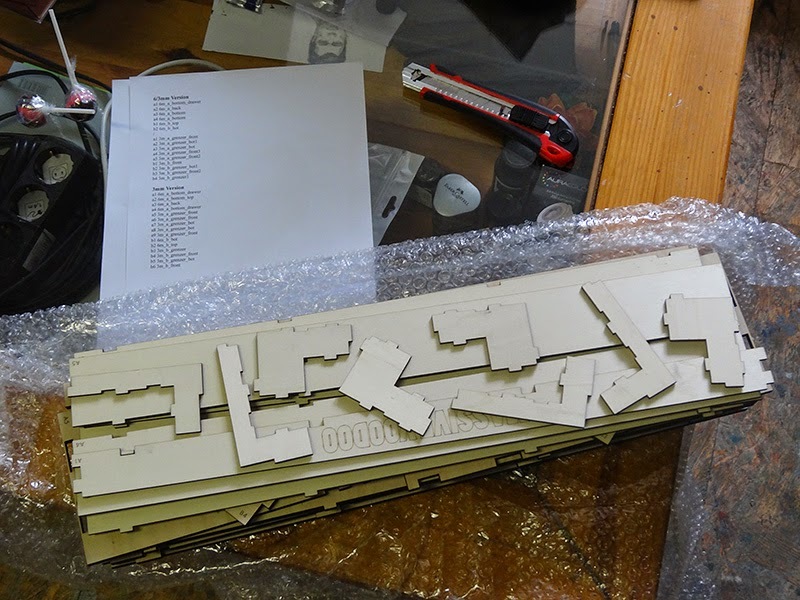 We improved the assembly a lot, now it's really easy to put everything together. So many different prototypes were produced, but in the end it was really worth it. In the next weeks, more will be shown of this new project, keep your eyes peeled! 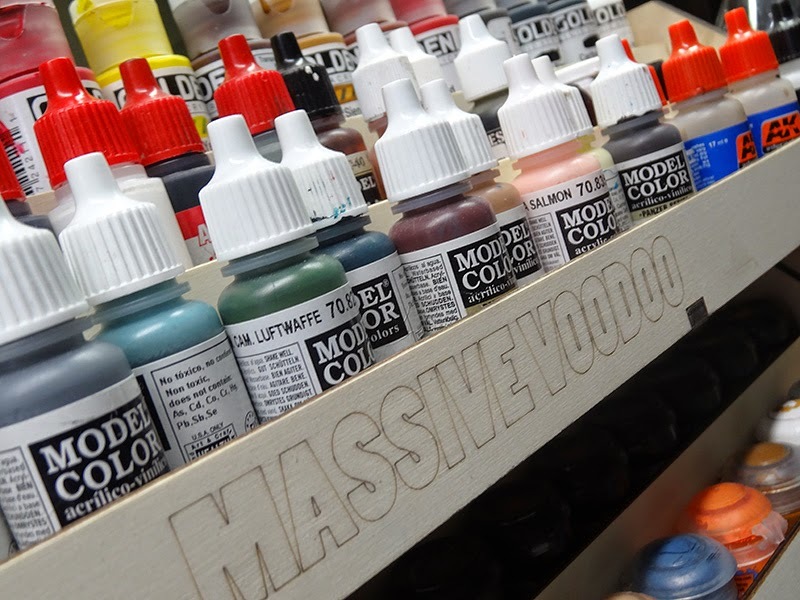 We don't want to give up to much of the final paint rack details and features, but believe us one thing, this will change the way you organize your painting table AND your hobby travels. 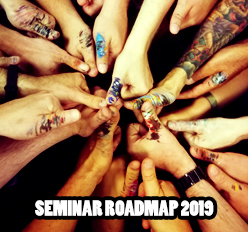 There are 32 Kommentare for Building the perfect Paintrack - The journey! Very curious about the final product! me likes, me wants one...me want to know when? Great pictures and prospect to look out for. 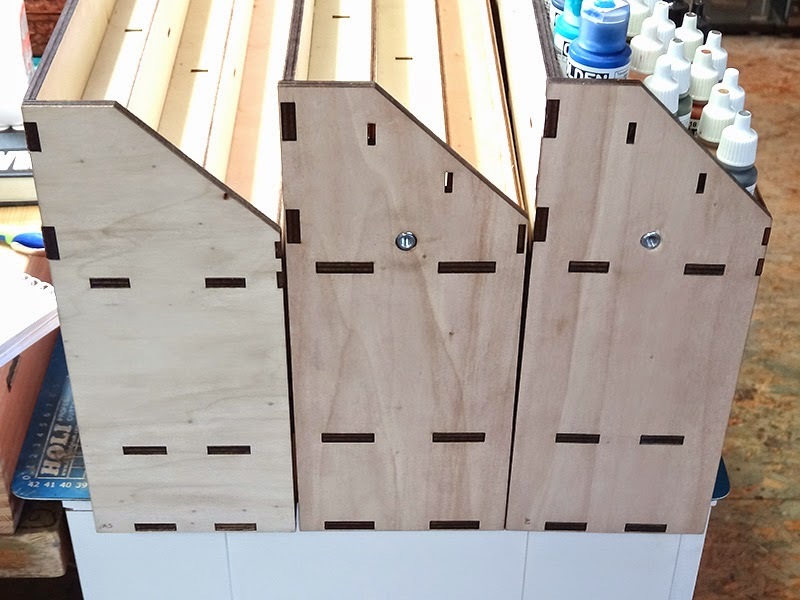 I was looking at getting a paint rack last week but now I will wait a bit and see how yours stacks up to the one I was thinking of getting. I need one of those. My table is a mess! I need one !!!!! hurry!!!! 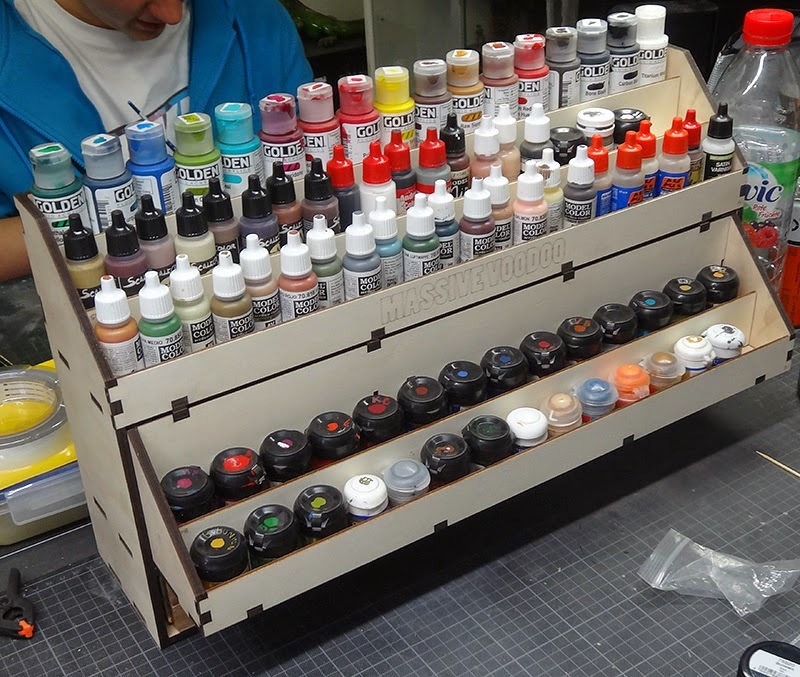 How many paint bottles can fit in the rack ? Very cool idea, looks brilliant! Do GW Citadel Colours also fit in? As far as i remember the Vallejo bottles are slightly thiner. Will there be a place for brushes, a water vessel and a current 28mm project :D? Like it - finally someone who paints did something for the others! Oh my! I've been looking for a good paintrack for some time. I haven't found a good one yet. 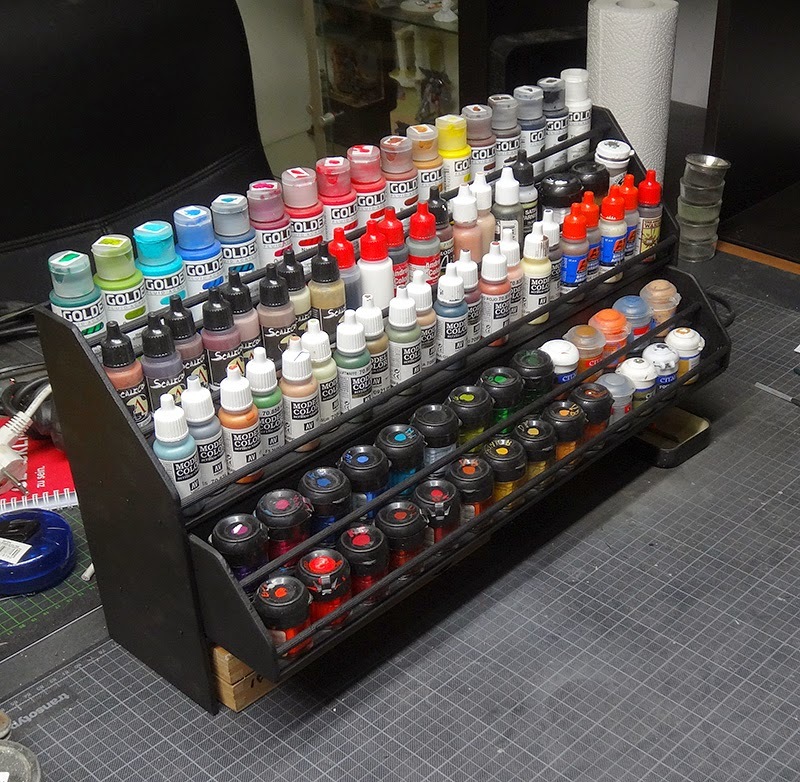 I need one that can handle different kinds of paint (GW, vallejo, PV3) and saves me space, because my paint bench is so small....this looks perfect! Can't wait. That looks like a very useful tool. I still have trouble keeping my hobby space organised. Is there a 'paint your new MV rack' competition in the horizone? Oh perfect! I'm getting one! Very soon, hopefully less than a month! Around 110 Vallejos... you can also mix different brands. Make it available to us all. 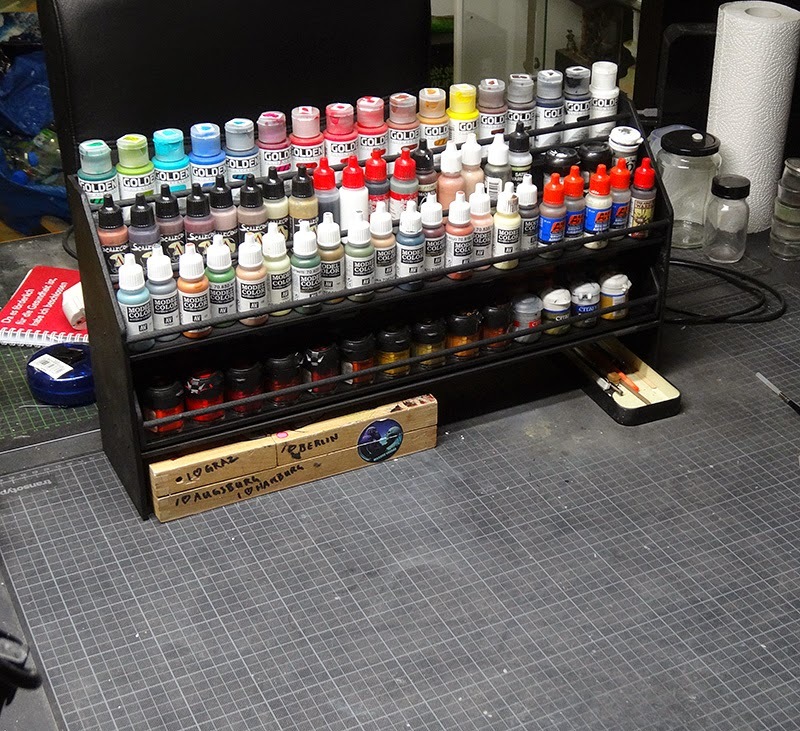 I have been looking for a mobile paint storage sullution for quite some years (say about 10) Curerntly I use a big toolobox and a GW storage box. It works but it's not what you want. Looking forward to seeing the final products. I intended buying some perspex ones locally, but it only holds 54 pots of vallejo. This is so freaking awesome! I paint on my kitchen table so I have to put up and tear down everything each time I paint. This would make the process so much easier! Any idea on a production timeline? We are on it to hand out a lot more information soon! Really soon! Hi, i missed Kickstarter, any chance to find it now ? Nowhere right now. Raffaele Picca is the project manager of this and there were romours about having the Paintrack available again in the future. So far, the Massive Voodoo crew does not know more than you about the romours.